We’ve all heard a lot about averaging down, scaling in, waiting for a pullback, and other clever methods for entering a position. Most active investors, those who follow a medium to long-term trend, wouldn’t think that whether you enter on open following a signal, or the close, or even the next day, would make much difference in the long run. But it does. When I’m entering or exiting a trade, whether stocks or futures, I’ve always acted as though I’m a floor trader. If the market opens higher, I place the sell orders first, and if it opens lower, I buy first. It’s rare that there isn’t a reversal after about 15 minutes, then I do the opposite trades. I’ve found that I consistently beat the opening price, which is what my systems post as a fill, so my slippage is near zero. The 15-minute window that I use is convenient because I can get all my trades off and then attend to other business. But it turns out we can do better, much better. We’ll look at two futures markets from 1998, the S&P (ES) and unleaded gas (RB), both quite different. Because of the high correlation between S&P futures and the SPY ETF, these results should apply equally to either market. Buy and sell signals will be generated by a simple moving average, 120 days for the S&P and 40 days for Unleaded. The reason for the difference is that the S&P is much noisier, that is, prices jump around, and shorter moving averages don’t smooth out the prices enough to be profitable. We want to see if a profitable system can be more profitable by entering at the right time of day. Buy when the trend turns up and sell when it turns down, based on daily closing prices. The benchmark entry will be the open of the next day. We compare the benchmark open with executing at every 30-minute interval during the day (call it bar N). We also look at executing any time before bar N if the price of the bar is below the close of the previous day (call it bar N pullback). We use 30-minute intraday data for the S&P futures, which means there are 13 bars from 10:00 AM to 4:00 PM, where each bar includes the previous 30 minutes of data. Futures markets are leveraged; therefore, profits and losses will be larger than most equities. For these examples, we use 25% of the available investment for margin, giving an effective leverage of 12:1. During the period from 1998, there are 149 trend trades. Each trade had a position size determined by $25000 divided by the dollar value of 20-day average true range, so that every trade has the same expected risk when it is entered. That way no one trade can overwhelm the results. There were 9928 total contracts traded. Table 1 shows the results. Table 1. Results of S&P tests. For each time interval, the green section (center left) shows the result of executing only on that bar. The red section (right) shows the results entering at any bar better than the previous daily close, but no later than the designated bar N.
On the left, under the section “Improvement,” the total profits (Total PL) go from $354,808 to $769,644 by waiting 5 hours instead of executing on the open, a gain of more than twice the initial amount. That’s a serious improvement. Anyone can profit from this by simply waiting for the next close rather than executing on the open following a new trend signal. We exit a trade at the same time as the new entry. On the right we get a little more complicated, but more in line with how a trader might execute. For example, if we choose to wait no more than 2 hours after the open, we can execute a buy if the open of any prior bar is below the previous day’s close. We do the opposite for short sales. This option did not do as well, but still improved the opening price returns by a factor of 2. 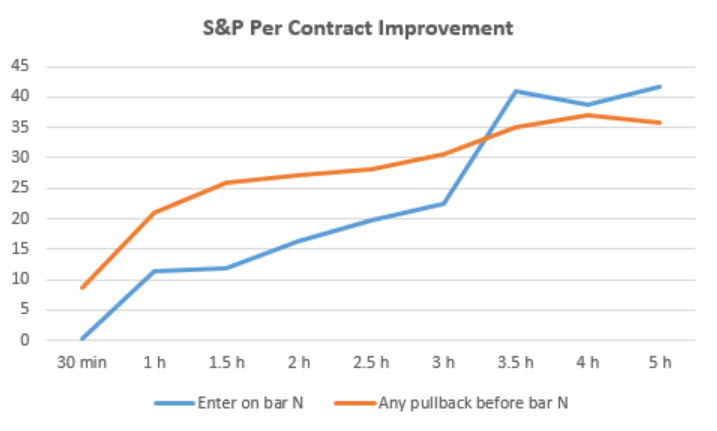 Chart 1 shows the per contract improvement for the S&P entry options in 30 minute intervals. They peak in the mid-afternoon of trading in New York. Chart 1. 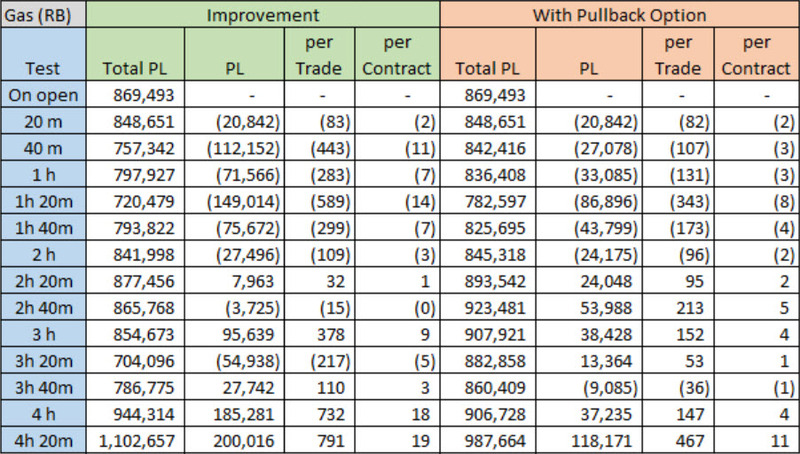 Profit per contract improvements by delayed entry and exit for S&P futures. The energy market has long periods of low volatility followed by shorter periods of panic. It’s difficult to say if it’s a “trending market,” but a simple 40-day moving average applied to futures has been profitable. Using that as a basis, we see how delaying the entry throughout the short trading day changes the returns. Table 2 for unleaded gas is similar to the S&P table. It shows a more erratic pattern, but ends with the same conclusion that waiting until late in the day to execute the trend trade is more profitable than executing on the open. Returns are improved by 25% on the left. Still not too bad. A chart of the per contract improvement follows. Table 2. Unleaded gas futures from 1998. Returns are improved only near the end of day. Chart 2. 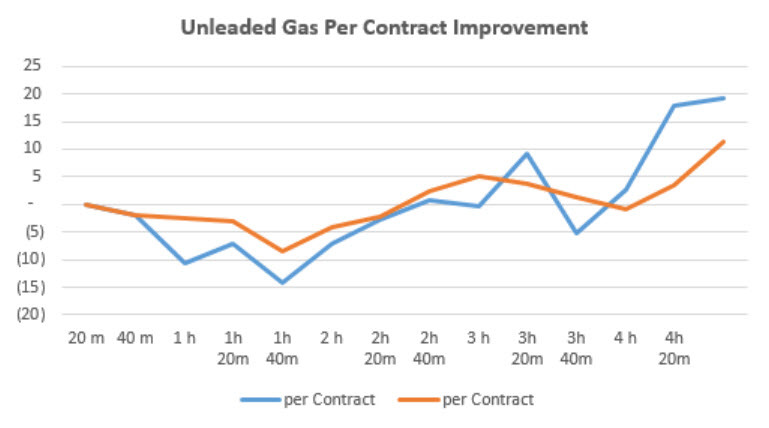 Profit per contract improvements by delayed entry and exit for Unleaded Gas futures. I’ve had some experience with timing various markets. If we’re using a trend system for Eurodollar interest rates, or any short-term maturity ETF, you always enter as soon as possible because prices just keep going in the same direction. For U.S. equity index markets, I have found that they have the highest level of noise, so I expect that waiting can produce a better fill. That seems to be confirmed by these tests. As for other markets, interest rates are most trending in the shorter maturities and less so at the long end. FX are also trending, but of a shorter period. The biggest gain from delayed entry will come with equity index markets, especially in the U.S. and Europe. Perry Kaufman is a financial engineer and trader. He is the author of Trading Systems and Methods, 5th Edition (Wiley), and A Guide to Creating a Successful Algorithmic Trading Strategy (Wiley). For question or comments, please visit his website, www.kaufmansignals.com.